Once we breezily cleared our immigration and collected our two luggages, we went out to search for Alex. He is our trusted, reliable and friendly limo driver, whenever we visit Sydney. Remember how we declined our pre-booked in-flight meals as we were sleeping during meal time? We were so famished and thirsty we requested for a quick breakfast at the arrival hall. Alex Anani introduced us to a kiosk that serves halal pita bread, baked on the spot! Brews fresh ground coffee too. We bought apple juice for the kids but oh, fresh pita bread with latte for breakfast was simply divine! He was so kind he let us eat and drink in his luxury car (we promised not to leave crumbs or spills). There has been an upgrade to his Mercedes-Benz since we last saw him and kids were thrilled with the sunroof. They kept saying it was just like their grandad's last car and how it works differently from the current Lexus sunroof, I distracted myself by looking out of the car window as we passed Zetland and headed into the city. I felt right at home. Home away from home. Only with cleaner air. A short 20 minutes later, we arrived at Meriton Pitt St. Check-in time was brief as they had all our details. The bonus was that they had a unit of serviced apartment ready for us right away at noon. Check-in time is stated at 2 pm and we were not charged the extra couple of hours. Sweet! The reception staff was also culturally-sensitive/aware and asked if I had any objections to the number 4404 fengshui-wise. We did not mind one bit and our only minor comment after being shown the unit was that the master bedroom was a bit of a squash and a squeeze. The extra two hours allowed me to unpack, got everyone showered and we ventured out to Woolworth for supplies (laundry detergent, dishwashing liquid, fruits, tea, cereals and bread). We went out again for a walk as soon as the groceries had been brought home. There was a construction site along Kent St. so luckily we did not select Meriton Kent St.! We walked towards Pitt St Mall and since there were buskers everywhere, we did not have a chance to go shopping. 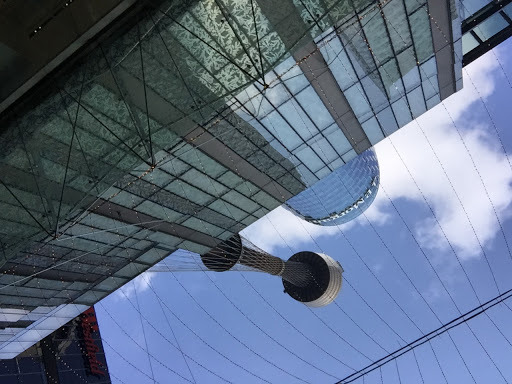 Bean asked for a photo of Sydney Tower from Pitt St Mall before asking for an early dinner from the Japanese cafe near Meriton Pitt St. He got over-stimulated at an electrical and computer store, and only cooled down once we were outdoors. After a quick dinner and wash up, we retired early to recharge for the adventures ahead. I did the laundry with eucalyptus laundry gel - and be the first woman in history who regrets not buying a dozen bottles of laundry gel to bring home. Oh, Sydney. You have changed so much and yet everything is the way it is.